Just a quick little Run Report for today – not even many stats!! 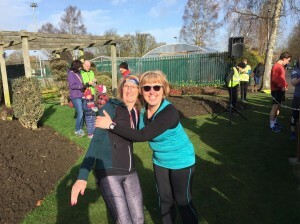 So plan B was a ‘home’ trip to lovely Welland Park and a chance to catch up with friends all round, with of course one of the best breakfasts you’ll find at any parkrun. A busy morning at the bowls pavilion as 50 (yes 50! – the second highest we’ve ever had) volunteers all queued up with Jo (RD in charge today) to announce their presence (loads of Duke of Edinburgh students, many of whom are near to completing their relevant awards – congrats). A huge thank you to all the volunteers – after we only had one Marshal earlier in the week, we were bowled over by how many volunteers rallied to Jo’s cry for assistance. Thank you all. A postponed parkrunner of the month medal award for Sylvia (great running recently Sylvia!) and we were off. On the way around I was able to observe our lovely parkrun and I couldn’t spot any ‘incidents’, so well done everyone and thank you for sticking to Jo’s ‘deal’. One of our parkrun Ambassadors was visiting today (Mark), so after collecting my finish token I trot across the field to run the final lap with him – he’s on a good run of form at the moment, so I ‘encourage’ (if that’s the correct word?) him around the last 300m. Later on a time of 25:22 is confirmed – result! – an MH PB for him by 22 seconds and his quickest parkrun time since 2015 – well done Mark! After scanning, I wander down the straight helping ensure all the other parkrunners who have finished are still keeping left to the left so as not to block anyone still running. I decide to pick on someone else to ‘encourage’ their finish. From 450m out, Allyson duly creates a 20 second gap from the position she was in – well done Allyson, there’s more in the tank! As the winds blow in a shower-and-a-half, it’s time to start helping tidy up the kit ready for next week and soon I find myself sat outside the café having breakfast with Mark in the sunshine! We pass the time contemplating how parkrun does amazing things for so many people, before stepping inside for some obligatory cake and check in with Jo and Clive who are finishing off today’s results. So there we go. Another little Run Report dashed off. There are plenty of gaps in the volunteer roster for the Run Report Writer role – one of the few volunteer roles that can be done whilst also parkrunning the course. If you have a story to share and would like to have a go for this role, just let us know and we’d love to hear from you in future. For now, well done to all 387 parkrunners and 50 volunteers who all made today happen. Congratulations to Mark and the other 60 of you who recorded PBs today – great stuff. We welcomed 24 first timers, of whom 8 were completely new to parkrun. We hope you return again and again and grow to love parkrun as we all do.